Sweet Surprise Slots is 5 reel, 25 line progressive video slot designed by Top Game. Choose this funny game and you will find yourself in the candy world where you can smell the chocolate, berry pies, whipped cream and strawberry soufflé. 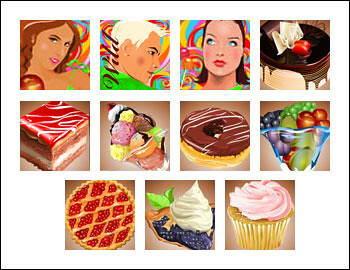 But the cherry on the cake is the most sweet and tasty – top jackpot of 2,500 coins or $12,500. You should also taste such sweetmeats as Free Spins, Bonus Game and tremendous progressive jackpot. This game can be found in no download format that allows you to connect it instantly. Sweet Surprise has following symbols: Berry Pie, Berries, Ice Cream, Chocolate Cake, Strawberry Cake, Doughnut, Whipped Cream and Soufflé. Special game symbols are: Girl with Apple, Girl with Lollipop and vGuy. For your convenience this game offers you different coin denominations to choose from: $0.01, $0.05, $0.10, $0.25, $0.50, $1.00, $2.00, $5.00. The minimum bet is $0.25, the maximum one is $125. 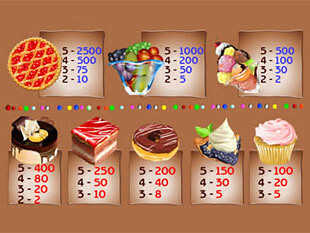 The highest sweet jackpot is 2,500 coins or $12,500 for 5 Berry Pies. The second sweet jackpot is 1,000 coins or $5,000 for 5 Berries. The third sweet jackpot is 500 coins or $2,500 for 4 Berry Pies. The wild symbol is Guy that acts as a substitute for lacking symbols. In other words, it replaces the lacking symbols to make the winning combination complete. The scatter symbol is Girl with Lollipop. This icon can appear anywhere on the reels and makes winning combinations independently on the active lines. This symbol triggers Free Spins feature. Free Spins. This feature is activated when Girls with Lollipop appear on reels 2 and 4 at the same time. You will be awarded with 5 Free Spins. This feature can be re-triggered. Bonus Game. This feature is triggered when 3 or more Girls with Apple appear on reels 1, 3 and 5 on any of the active lines. This round promises to multiply your current bet by 170x. Sweet Surprise has prepared the best surprise for those who prefer to play for high stakes – progressive jackpot. It can be won on condition that you play with maximum bet and you will catch 5 Guys on the active line. 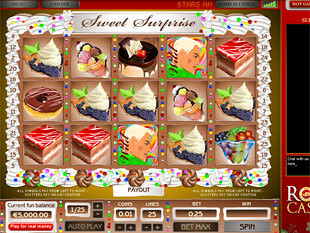 Sweet Surprise slot machine is matchless video game offering you the most original sweetmeats which will surely be to your taste – top and progressive jackpots, you won’t buy them in any other candy shop.